While on the subject of flowers in art, I realised that each artist has favourite flowers to which he or she returns again and again, whether because of colour, form, symbolism, or whatever. You only have to think of Georgia O'Keeffe - her depictions of calla lilies are numerous. She loved their sensuous shape, their wonderful designs. In fact, she said quite a lot about painting flowers which especially applies to her Calla Lilies: " When you take a flower in your hand and really look at it, it's your world for the moment. I want to give that world to someone else. Most people in the city rush around so, they have no time to look at a flower. I want them to see it whether they want to or not." She also remarked, "I decided that if I could paint that flower in a huge scale, you could not ignore its beauty. " She was quite right. When you walk into a room and see one or more of her Callas paintings, they stop one in one's tracks. When you look at a calla lily painting or drawing, the symbolism is also implicit: since early Roman times, callas have represented celebrations and purity, hence their use for weddings. Although they originate in Southern Africa ( perhaps why I love them so much, being from that part of the world), they bloom well in the dark of winter and symbolised the passage of the winter solstice for the Romans. That is perhaps why they are also used so much for funerals, at the darkest time of the year. They came to Europe many centuries ago, but the first known illustration of them was apparently in 1664, when a calla lily was growing in the Royal Gardens in Paris. Since then, countless artists, from Diego Rivera to Marsden Hartley and Ellsworth Kelly, have depicted callas. 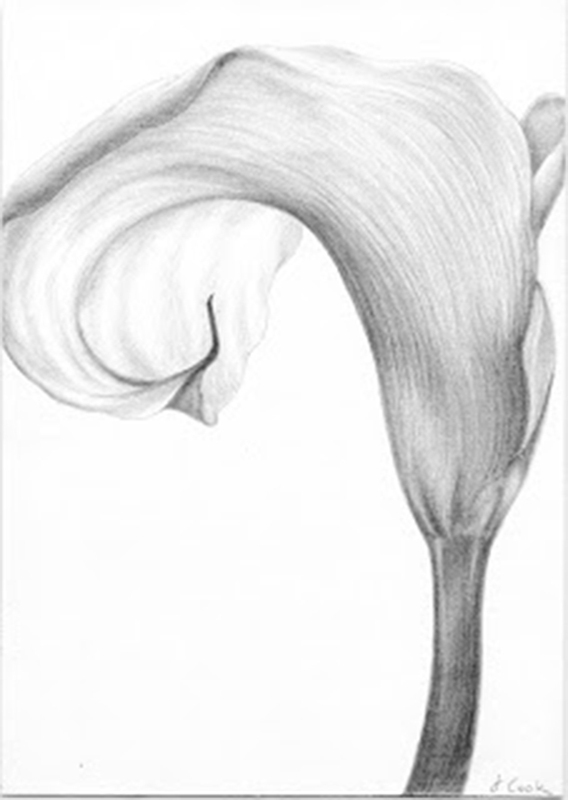 I keep returning to calla lilies myself - they seem to lend themselves to silverpoint drawings, with their high key elegance and sensuous forms. They are living sculptures. Another flower to which I alluded in my previous post about flowers in art is the Regale Lily, favoured in paintings about the Annunciation. It too is a wonderfully elegant, perfumed lily, which keeps calling me to draw it, every time that I find it blooming in my mother's garden in Spain. Each time one is differently inspired - perhaps the light is different, perhaps the flower is slightly different or at a different stage of opening, but whatever it is, I love to return to these lilies, both callas and regales, just to celebrate their beauty. And while I am drawing them, time stands still, and the world comes into balance. Miraculous.